AMD has come out defending its new Ryzen processors, addressing concerns which have recently been aired on possible problems with Windows 10’s thread scheduler, and temperature-related issues. 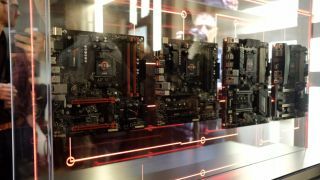 In a blog post on AMD’s community site, the company said it had investigated reports of Ryzen suffering decreased performance levels at the hands of incorrect thread scheduling. The company further claimed that there’s no issue with scheduling differences between Windows 7 and Windows 10 affecting Ryzen CPUs based on the ‘limited’ available evidence, adding that any performance gaps are likely due to differences in the overall software architecture of these operating systems. In short, regarding the whole thread scheduling controversy, AMD is saying there’s nothing to see here – move along. From our point of view, even if there was certainly some kind of an issue, any performance hiccups caused by nuances of the operating system are likely to pale in comparison to the true problem behind the complaints of 1080p frame-rate woes – namely games which aren’t yet fully optimized for Ryzen. AMD has previously said that 1080p performance will improve as developers get more time to optimize for Ryzen processors, and that some 300+ game devs are currently working on doing so. But this will obviously be a slow process happening over time, game-by-game. The company also said it had investigated reports of SMT (simultaneous multi-threading) causing poorer performance in some games with Ryzen, concluding that SMT should “generally see a neutral/positive benefit” in games, and AMD has observed this across many titles. For any outliers AMD asserted that once more, further optimization of said games should prove beneficial. Finally, AMD made a statement on the temperature Ryzen processors are reported to be running at by the main sensor on the chip (the ‘T Control’ sensor). With the Ryzen 7 1800X and 1700X models (but not the 1700), this temperature is actually reported as 20 degrees C higher than it is in reality, with this offset being implemented to ensure all processors have a ‘consistent fan policy’. So if your chip seems to be idling at 50-something degrees C, there’s no cause for concern, as it’s actually running at 30-something as you’d expect. In the long run, temperature monitoring utilities will be patched up to read this offset, and report the correct temperature for the CPU.